It was Bata Furai’s header minutes into the second half that gave the home side the 1-0 win following a foul on Gagame Feni just outside the Erakor Golden Star 18 yard box. Solomon Warriors playmaker, Judd Molea, chipped in the cross and the defender was at the right place at the right time to nod the ball into the back of the net. Solomon Warriors coach, Moses Toata, was a relieved man after the match acknowledging that his side was really put to the test. “As we expected Erakor (Golden Star) gave us a good run for our money today and exposed some of our weaknesses. However, it is always good to come away with a win so we have something positive to build upon for our next clash,” Toata said. The intent was clear from the Solomon Warriors outfit as they chased an early advantage but could not break the Erakor Golden Star resolve before the break. Futsal international Micah Lea’alafa led the way in the 10th minute with a chip over Ernest Bong but Brian Kaltack recovered in time to clear the ball to safety. Four more unfinished plays followed as it became apparent that finishing was an issue for Solomon Warriors despite their near utter dominance of the opening stanza. James Naka stumbled in the 29th minute and efforts from Dennis Ifunaoa and James Donga also found little favour from the home crowd. The second half saw more enterprising runs from the Erakor Golden Star forwards as efforts on goal started coming from them. Jean Kaltack scared the stadium with an individual drive but his finish was well read by Silas Seda who went low to make the save. Jack Nicko was also threatening on the flank but Emmanuel Poila and Hadisi Aengari kept him in check. Midway through the second half Erakor Golden Star were dealt a tough blow when Bong exited the pitch with a hamstring injury and second in goal, Julian Kalotana, was called in. However, Kalotana did not have much to do as his defenders provided him adequate cover and the tiring Solomon Warriors front line applied little pressure. Both teams poured in substitutes as the match drew on but the required impact could not be made. 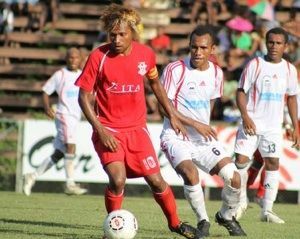 Fortunately for Solomon Warriors Furai’s goal was enough for the day. The second match in the tri-friendly series will take place on Wednesday at 4:30pm and final clash will be at the same time on Friday.